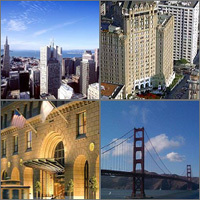 Compare discounts for Hotels in San Francisco, California! San Francisco is a city of excitement and beauty, with the hustle and bustle of sightseeing and business by day and the magic and glamour of dining and the performing arts by night. Considered to be one of the most beautiful cities in the world, San Francisco is also one of the most European cities in North America, with small streets lined by Victorian homes, Cable Cars and a cosmopolitan atmosphere. San Francisco has a lot to offer to visitors. Union Square is a shopper's paradise of designer boutiques and large department stores, The Crookedest Street in the world located in the Russian Hill District is a famous picture taking spot, Golden Gate Bridge is one the world's greatest urban parks, and Pier 39, is one of the most visited attractions in California. All around the city numerous other attractions and places of scenic beauty can be found, making San Francisco a must visit for everyone. Towering high above San Francisco breathtaking skyline, Mandarin Oriental has earned acclaim for bringing the best of Asian service to one of the world's most alluring cities. Built as one of the first grand hotels in the United States, the San Francisco Palace Hotel recreates the ornate, gilded glamour of nineteenth-century high society. The Hotel Palomar is located in San Francisco's downtown area, 2 blocks south of Union Square with the cities finest shopping and dining and one block north of Yerba Buena gardens. Centrally located on Union Square with a cable car stop at the front door, the Westin St. Francis hotel has been a luxury hotel and a San Francisco landmark since 1904. Campton Place Hotel in San Francisco provides the quiet, intimate atmosphere that is often lost at many large hotels. Set in the heart of downtown San Francisco's 'South of Market' area, the W Hotel is adjacent to the MOMA and is across from the Moscone Center. The Fairmont San Francisco is a first class hotel located in the Nob Hill area of the city, minutes from Fisherman's Wharf, Chinatown and the Golden Gate Bridge. Almost a century old, the Italian Renaissance-style Clift has been brilliantly reconceived by designer Philippe Starck, and it's the talk of the town. One of the top 5 luxury hotels in San Francisco, the Omni San Francisco is located in the heart of San Francisco thriving financial district on the corner of California and Montgomery Streets. The Grand Hyatt San Francisco is a deluxe hotel located on Union Square in the heart of San Francisco, 15 minutes from San Francisco International Airport. The Hotel Nikko is located in the heart of San Francisco, just steps from Union Square amid the city's premier shopping and theater districts. Le Meridien San Francisco Hotel is set in the heart of the Embarcadero district of San Francisco, deeply entrenched in its vibrantly cultural and inspired surroundings. Depart the chic setting and step right onto the San Francisco Cable Car to experience a remarkable adventure through the streets of San Francisco. Discover the unique culture and vibrant communities that speckle the hillsides in a way the Conquistadors could have never imagined.